High cholesterol, or hyperlipidemia, is characterized by the presence in the bloodstream of abnormally high total cholesterol -- combined high-density lipoprotein, or HDL, and low-density lipoprotein -- LDL, abnormally high LDL -- bad cholesterol, and/or abnormally high triglycerides. This condition can have adverse affects on your eyes, causing corneal arcus, retinal vein occlusion and xanthomas. Whitish, gray or yellowish deposits around the circumference of the cornea are associated with high cholesterol, particularly among those individuals with extremely high levels of cholesterol and those with familial hyperlipidemia (an inherited predisposition toward high cholesterol and high blood triglycerides). 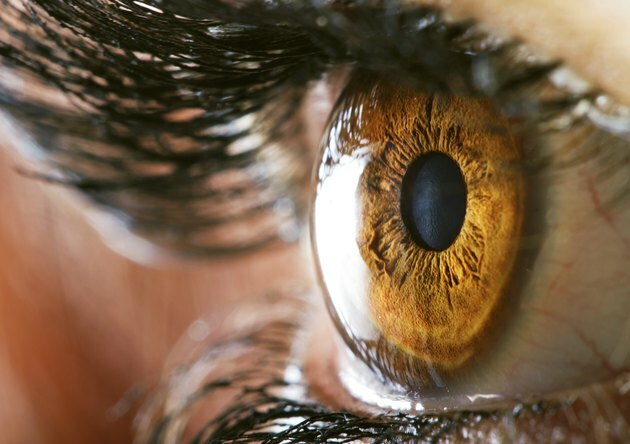 Called a corneal arcus, this ring appearing around the iris has also been shown to be related to diabetes and high blood pressure, so further testing is needed to determine the underlying health condition when a corneal arcus is spotted. Its prevalence increases with age, and it is more common among men than women. A corneal arcus does not usually affect vision, and treatment is typically focused on controlling cholesterol. Vascular disease of the eye is a concern in individuals with high cholesterol. Cholesterol lines the blood vessels in the eye just as it lines the blood vessels in other parts of the body. When cholesterol buildup reaches a certain level, a blockage in a blood vessel from the retina can occur. This blood clot may cut off blood supply to parts of the eye or may burst, ultimately leading to loss of vision in the affected eye(s). Usually, symptoms of retinal vein occlusion happen acutely with patients experiencing a sudden blurring or partial or total loss of vision. Treatments for retinal vein occlusion include aspirin and laser treatments. Outcomes will vary by case, but in many instances, some vision can be restored. Xanthomas are fatty deposits beneath the skin that produce soft, yellowish bumps on the skin's surface. They may occur around the eye and in other parts of the body, as well, including the elbows, joints, tendons, knees and buttocks. While not contagious or harmful in and of themselves, they can be disfiguring and are a sign of a more serious underlying medical problem related to elevated blood lipids. Occasionally, xanthomas may burst (called eruptive xanthomas ), at which time medical attention should immediately be sought. Can You Tell If You Have High Cholesterol by an Eye Exam?